Redbank and the land surrounding are acknowledged to be significant to the Traditional Owners, and a number of sites of significance are known to exist along Hanrahan's Creek and further downstream. A Redbank Working Group was established in 2013 with the initial meeting held at Redbank in September 2013. The Working Group aims to meet biannually and is intended to provide a forum for all stakeholders to be informed regarding activities at the site. Following the meeting in September 2013 local Garawa artist Jacky Green painted a record of the agreement reached with the Ministers. A copy of the painting and the story behind it are presented below along with comments from people who have been impacted by the contamination from Redbank. 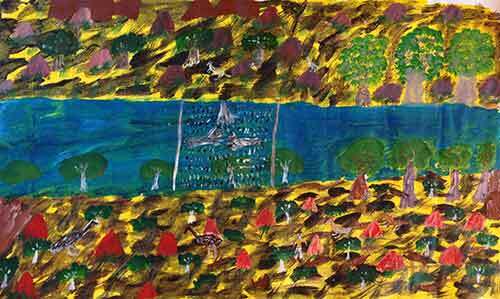 This painting is about the agreement the Northern Territory Government and Redbank Mining Company made with Garawa traditional owners about fixing up the pollution leaking from Redbank Mine. In September 2013, we had the meeting with the government and Redbank mining company about Redbank Mine that’s located on Garawa country near Wollogorang. There’s been a lot of damage to that country from the mine. It’s been going on for a long time and we been real worried about it. The meeting opened a lot of people’s eyes to what’s been going on. The reason I put this painting together is that the Garawa traditional owners for that country have never had a decent agreement with the government or the mining company about the country where the mine is located. If we did the damage wouldn’t have happened. At the meeting were traditional owners for the country, the Minister for Mines and Energy, Willem Westra van Holthe, the Minister for Land Planning and Environment, Peter Chandler, and representatives from Redbank Copper Pty Ltd. The government and mining company made an agreement with us. The agreement was to fix-­?up the mine, to stop it leaking into the creeks and waterways on our country. And to heal our country so that it’s safe. In the painting are three hands: one is the government, one the mining company and one the traditional owners. The painting represents the agreement the government and mining company made with us at the meeting. It’s how we see the agreement as Aboriginal people. Once you make an agreement with us, we stick to it. We may not use pen and paper but we listen to what the words say. The Minister told us that fixing up Redbank Mine so it doesn’t damage our country, our fish our turtles, and our sacred sites was a priority for his government. He told us he would apply for money from a thing called the Mining Remediation Fund. Then all three parties would set up a team to work together, to keep an eye on one another so everything runs smoothly. As part of the agreement, Aboriginal rangers and old people will work with the government and the mining company to fix the problem and keep and eye on things. We got to make sure our sacred sites are safe. In the painting the three hands rest over Hanrahan’s Creek that’s bright bluey-­?green from pollution leaking from the mine and killing everything in the creeks. Along the banks there’s places with no trees, they can’t grow there because the waters polluted and it’s slowly killing them. In the foreground stands a man, he represents the whitefellas that been mining our country and causing the damage. They wander around the place, they never talk to us and they never recognise us as owners for that country. The emu, kangaroo, goanna, turkey and ducks represent the animals that used to live on the country, but they gone now because the country is sick. The site where the mine is located used to be an important stopping-off place for our people on their journeys. It was a place were there was always food but now there’s nothing. Through the agreement we are all going to work together to heal the country so we can leave it to our children and grandchildren and all the other ones yet to come. “That place where we were walking [Redbank mine site]. We used to stay there, before, when we used to walk from the place Ngarlalina. We used to roll our swag and stop near [Hanrahans] creek. We used to have a big camp, sit down for maybe four days. Get Kangaroo; my father and my grandfather used to spear them with a spear. We used to sit down and make fire. My mother and my grandmother used to get wood and make big fire. My dad and grandfather used to cook the kangaroo, take it from the fire, cut all the meat and share it to all the family. "Maybe tomorrow they would go hunting for Emu. When the Emu came down to drink the water they used to spear him with a spear. My grandfather used to wait at the water where [Hanrahans] creek is. It was really lovely back in that day, that water. One Emu used to feed the whole family: Go back and cook it, share it with the family. Another thing - night time used to come. By moonlight my Aunty Phyllis and Aunty Clara, they used to go nighttime with a dog, go look for [echidna], one each. I used to walk with them too. "The future, you know when I go through it and I start thinking about [Redbank mine], it really hunts my feelings. It never been like that before, that place. I feel sorry." “We have grandchildren and kids coming up, we need a future. The mine needs to do the right thing by the people. Our young kids need to get on the country, hunting and fishing. They can't be frightened of contamination. We need to make to make sure that the country is safe for our young people to go back, to work, hunt and live on their grandfather's and grandmother's country. “From my side as Junggai, and my wife's side as Traditional Owner, I like to see government make an agreement with Traditional Owners and Junggai before they go ahead and do work there. They talk to and negotiate with Traditional Owners and Junggai of country.